This famous copy of an English translation of the Bible was probably made just before or about 1408 when copying, possessing and even reading the Bible in English were banned. John Wycliffe (c. 1330-1384), an Oxford professor who held the Bible as the supreme authority over the clergy or even the pope, inspired his followers to write the first complete English translations of the Bible. This one is decorated with cuttings from earlier Bible manuscripts, possibly to make up for not being able to commission pictures for a text which was already or about to be outlawed. The cuttings appear to come from manuscripts made in the North Midlands. Most of the Wycliffite translators attempted to keep their translations as close as possible to the Latin text. The use of pictures from Latin copies of the Bible may reflect a desire to maintain traditional illustration as well. Here Psalm 52 (53, 'The fool says in his heart'), which begins at the large letter 'T' in the second column, is illustrated with a picture from a 13th-century psalter showing God casting arrows upon fighting men. The first words of the Psalm in Latin are written in the margin beside its beginning. 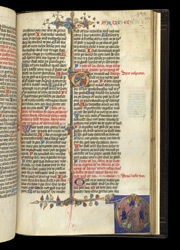 The book's title 'Sauter' ('Psalter') is in damaged, coloured letters in the top margin.